A padlock from around 1909 that's keyless and says "The Keyless Lock Company" and "No-key"! 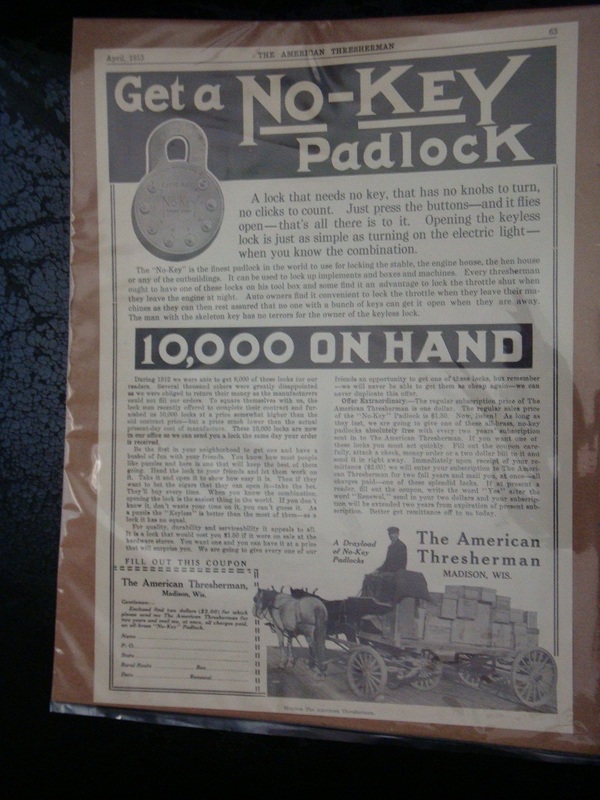 THIS IS A VERY NICE LARGE ORIGINAL 1913 AD FOR THE NO-KEY PADLOCK, 10,000 ON HAND, SOLD BY THE AMERICAN THRESHERMAN IN MADISON, WISCONSIN. AD SHOWS A WAGON DRAYLOAD OF NO-KEY PADLOCKS. AD IS IN GREAT CONDITION AND HAS EXCELLENT GRAPHICS. AD MEASURES 13 1/4" X 9 1/2".